I bought the Quest for Glory collection some time in the late 90’s and I never got to play it because by the time I finally got to it, I had already upgraded to Windows XP and it wasn’t compatible. I was frustrated to say the least, but I kept the CD’s just in case one day I might be able to play it. Well, that day has finally arrived. A few days ago I was flipping through my CD book looking for a CD with a backup file and I saw all of my Sierra games, mind you, I see them all the time and I usually just ignore them and keep looking for what I was searching for. But this time was different for some reason because I was still in website refurbishing mode. I figured, the Sierra games were such a huge thing in my life, I might as well add them to my website, and that got me really thinking about playing them again. I actually tried installing it, but when the installation program was running the tests to see if my computer was fast enough, it ended up crashing. I guess it was too fast. 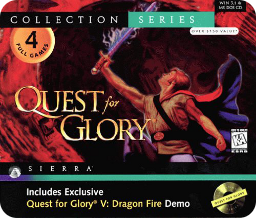 I went to Google and typed “Sierra installers” and I found a website which I blogged about and I found and installed the Quest for Glory collection, but there were still problems with it. There are 4 games in the collection and the first game has 2 versions; EGA and VGA. I immediately ran the VGA version because that is obviously a better quality, but it crashed when it got to the character selection screen. I ran the EGA version and that ran fine, but the quality was really horrible, like 1985 horrible lol. I checked the rest of the games and the 2nd one was fine, the 3rd one wouldn’t even let me see the Sierra logo, it just crashed upon loading the game, and the 4th one loaded without a hitch. After a few days, I had the realization that if I did decide to play these games, I would have to play the crappy graphics version that was similar to the original King’s Quest games, and there’s nothing wrong with that, I played those crappy graphic versions lol. But I feel that if I have a good version, why waste time on a crappy one right? I also had the realization that I would miss out on the third game. Yesterday I did realize that I could fix the problem. These installers have a program that allows you to configure the games before you play them since they use DOSBox. I did that last night by changing a setting, and the 2 that didn’t run, finally run. Here is the solution if anyone else has an issue with the Sierra installers. If you go into the start menu and go to Sierra then mouse over to the Quest for Glory collection (or any collection for that matter) then click “Configure Quest for Glory Games.” It runs sort of like an installation, but it doesn’t install anything. It asks you which games you want to configure and you check the ones you want and uncheck the ones you don’t want to fix. The next screen has the options, output is automatically on Overlay, so change it to the next one down which is OpenGL. That’s it. If that’s not good enough, change it to the next thing down. OpenGL works for me, so I’m going with that. I didn’t change that on all of the games, just those two that crashed on me. Although, if the other ones run fine, but then crash at one point, then I will probably end up having to change their settings too. 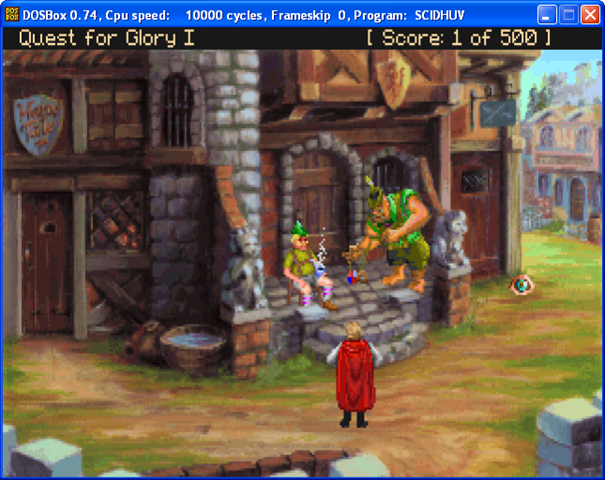 So yeah, here are 2 images which show the EGA and the VGA version of the 1st Quest for Glory game. The differences are night and day. You tell me, which would you prefer to play?